Grovia Diaper Pail Liners, with their elasticized drawstring and toggle, securely fit inside your cloth diaper pail without slipping. Use them as large cloth diaper totes too! GroVia Diaper Pail Liners can be used inside your cloth diaper pail or as large cloth diaper totes. No matter what style of diaper parents use, a diaper pail liner is one of the absolute "needs" when it comes to cloth diapering accessories. The washable and reusable GroVia Diaper Pail Liners, like the smaller GroVia Cloth Diaper Wet Bags, are both water resistant and colorful - who says cloth diapering need be dull?! An elastic drawstring gives a nice tug fit over the edge of the cloth diaper pail and the toggle secures the fit until you're ready to take it out on laundry day! Gone are the days when your cloth diaper pail liner slipped down into the pail with the diapers - eew! Measuring approximately 25" wide and 27" tall, the GroVia Diaper Pail Liner sufficiently holds two days worth of cloth diapers in your pail. When traveling, use it as a large cloth diaper tote between visits to the hotel laundry facilities, a friend or family members' washer/dryer, or a local laundry-mat. When you toss your cloth diapers into the wash, toss in your GroVia Diaper Pail Liner as well! Once it is washed and tumbled dry, fold your clean cloth diapers and covers into it to carry to your room, home, or back to the car. When not in use, fold it up small and tuck it into a diaper bag until it is needed again. We recommend rotating out a minimum of two cloth diaper pail liners. This gives the liners time to be washed and aired-out between uses. It also ensures you always have one handy when needed. The GroVia Diaper Pail Liners and GroVia Cloth Diaper Wet Bags will serve you well even beyond your diapering years. Use them to haul wet towels home from the pool or beach, pack a bag for the road, or to keep soiled shoes, sports equipment or uniforms separated from other items in your car or trunk. GroVia Diaper Pail Liners are fairly and conscientiously made in China. The GroVia All In One Cloth Diaper is a one-size cloth diaper sewn with a soft, 100% organic cotton inner and a leakproof waterproof outer. No Diaper Cover Needed! I really like this pail liner! 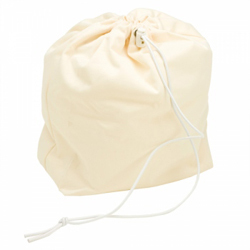 It holds a ton which is great for my situation of diapering 2 babies. I really like the drawstring feature! Giving it 4 stars instead of 5 just because I wish it came in other colors besides vanilla. I bought this pail liner not only to use for dirty diapers, but also for packing diapers while travelling or dirty clothes while on vacation. Nicely sized, great quality, I don’t mind that it doesn’t close fully because I use it as a liner in an open hamper. It hasn’t leaked at all, even with dripping wet flats in it, so I‘m totally satisfied a with this product. Because of the gusseted nature of this pail liner, I find my pail fills fuller (or without having to push out any air pockets). I wish I had this sooner when I had two in cloth full time! My only problem is that after just two washes, the little grommets came off already. I hope this doesn't compromise the integrity of the bag, but so far so good. I plan to just fix this myself once I find where I left my tools. Not a hard fix, but one expects higher quality with comparably more expensive items. I definitely love these more than I am bothered by the inconvenience though. I have another one I've had even longer that hasn't given my any problems at all. Definitely worth the buy! I love the pail liner! Wish I would have tried one sooner! It holds in wetness & contains smells. Easy to take from pail to washing machine.